A young bull elk is still roaming around Upstate South Carolina, but wildlife biologists are warning residents and visitors that it should not be approached or fed. 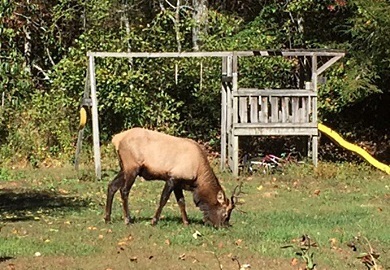 The elk was sighted Nov. 7 near the Pickens County town of Liberty. It was first seen in northern Pickens County, in the mountains, on Oct. 21. Social media in the past two weeks have featured numerous photos of the elk being fed and petted. Reintroduction of elk into Great Smoky Mountains National Park began in 2001. The population around the Great Smoky Mountains is estimated at 150 elk, and there have been numerous unconfirmed sightings in the Upstate of South Carolina in recent years. Legislation that was passed five years ago by the S.C. General Assembly protects elk in the Palmetto State. The legislation was promoted by the Rocky Mountain Elk Foundation, in anticipation of elk migrating into South Carolina. Wactor said the young bull elk was likely pushed out of its territory in Heywood County, North Carolina, by bigger bulls. Once the young elk realizes there are no female elk in South Carolina, it is anticipated that it will likely return to North Carolina.